Home/Ruminations/Tread Upon Our Content? We Won’t Take It! Or, Will We? Tread Upon Our Content? We Won’t Take It! Or, Will We? Last night, I caught the premiere of NBC’s new game show, TAKE IT ALL, hosted by Howie Mandell and had a little fun with it. 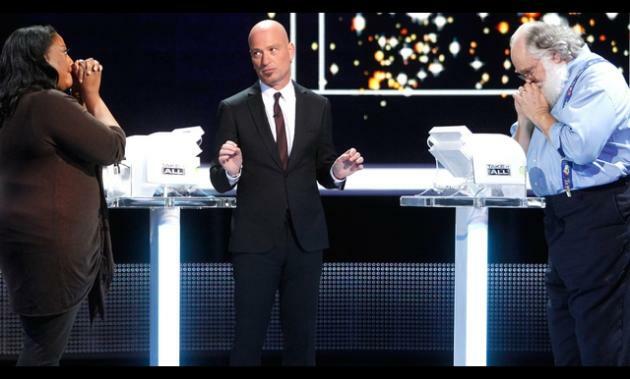 While I absolutely enjoy narrative shows – sitcoms and dramas – more than game shows, it seemed that the bells and whistles were more reserved and made more sense with the context of the game show than they do on the other content I watch on broadcast and cable. Those bells and whistles I’m referring to are the incessant promotional graphics that come up in the lower-third, upper-third, corner or even full screen. They are sadly more invasive than ever – partially due to DVRs, but seemingly more due to the lack of consideration for the content. How much will viewers stand to suffer as content is tread upon by messaging? David Goetzl wrote about the intrusiveness of networks over programming as a response to DVRs in his MediaPost entry this morning. While focusing on the encroachment of promotional messaging within a network’s shows, he posits that actually selling overlay advertising inventory may be right around the corner. I shutter to think how much that will diminish the actual content that provides the platform advertising relies on. Back at the turn of the century – remember 2000? – product placement for television was not effectively seen in Primetime. At that point, it consisted of a bottle of Mountain Dew given to the winner of a SURVIVOR challenge. There was a debate between networks and producers while trying to figure out who would make the money from those “promotional considerations.” Since that point, the integration of products with shows has reached – and perhaps exceeded – the high science of product placement in motion pictures. Back then, it was still reasonable to assume that the network could make their bucks through commercial inventory sales. But, is that opportunity window closing to the networks with the growing penetration of DVRs? The line marking who profited (network/producer) from what type of integration has certainly blurred, but profit participation becomes secondary when when weighed against diminished content by distracting overlays. An argument could be made that promotions are a different beast with the belief that “what’s good for the goose is good for the gander” and all shows benefit from the promotion of other shows on a network. But as Goetzl writes, our time-shifting sort of makes that argument moot. Either way, if overlay inventory is actually sold and an item is distractingly pitched over important narrative content, the network might have the short gain of a sale, but the long-term risk to the actual content (and its viewership) being greatly diminished. Going back to TAKE IT ALL, the ability to DVR proof promotional items within a game show is certainly a solution – but not something everyone can do. We saw how devastating game-show-full schedules can be to viewership in general (check that same turn of the century period) so a solution for narrative programming is required. Is that solution a widespread jump to running advertisements on top of narrative content? Absolutely not. That would lead even more viewers to stop watching or switch to the pay-TV programming that has gained ground on Showtime, HBO and Starz or shift to streaming options – definitely not good for broadcast and basic cable networks. Whatever the winning decision is, my hope is that they don’t tread on the content and destroy the television programs that have been the height of storytelling in the past few years. Enjoy the show, TAKE IT ALL, but don’t encroach on the content and Take It All away.